Alaska Northwest Books, 9780882404950, 32pp. To many people who gaze across Cook Inlet from Anchorage, Alaska, Mount Susitna looks like a slumbering woman. The Sleeping Lady is a modern-day folk legend that accounts for both Alaska's first snowfall and for the origin of this beautiful mountain. It is also a classic tale about a time of peace and the consequences of war. Enchanting oil paintings by artist Elizabeth Johns capture the village life of the giant people, a prehistoric, peace-loving group and the drama that ensues when they must face a band of menacing warriors. The tale centers on the fate of the story's two betrothed lovers, Nekatla and Susitna, whose encounters with war bring a lasting change to the land and their people. Cloaked in snow in winter and wildflowers in summer, Mount Susitna embodies the hope for peace so relevant at any age. As much a mythical explanation for natural phenomena as it is a tale about a time when people lived in harmony with nature and each other. 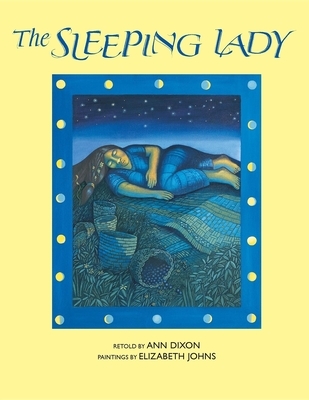 Ann Dixon is the author of numerous books including "Alone Across the Arctic, Big-Enough Anna," "Blueberry Shoe," and "When Posey Peeked at Christmas." She is a librarian and lives in Homer, Alaska. Elizabeth Johns is a painter and has illustrated several books including "The Sleeping Lady" and "Sunflower Sal." She is a former resident of the Pacific Northwest and now lives in Bristol, Tennessee.